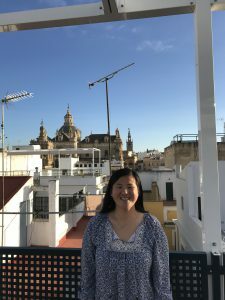 At the beginning of the semester I was sitting on the rooftop of TCC school here in Seville, Spain wondering what God had in store for me. The morning air was crisp with the slightest chill, but I couldn’t complain since it was below 0 back in Iowa. I hadn’t yet decided what word I wanted to focus on for the year. At first, I was thinking “whatever” from Colossians 3:23, which is one of my favorite verses. I figured it could be good since I’d be going on many new adventures and didn’t know what to expect, but I wasn’t completely set on it. After sitting in silence as I looked out over the city, the first line from the song “I Hope You Dance” by Lee Ann Womack floated into my mind. It goes, “I hope you never lose your sense of wonder.” Wonder, for me, is being in awe of God’s creation. How fitting? After spending the past three and a half years at the same school, in the same town, with generally the same people, I had almost stopped wondering. Naturally, since arriving here in Seville I have had a lot to wonder about, both to question and to be in awe of. I have wondered how to navigate the curvy streets of Seville, and how to politely tell my host mom I don’t like the juice she packs in my lunch. (That worked out. She was actually glad I told her.) I have also wondered how I can possibly express how amazing my study abroad experience has been, and if my calling is still what I thought it was. Lately, I have challenged myself to wonder at my surroundings. What once was foreign has become normal everyday life after being here for a while. Nonetheless, there is still so much I haven’t seen. Each day, as I walk through familiar (and sometimes not so familiar) streets, I try to look up, down, and around for something new to wonder at. It’s so easy to go through daily lives without thinking much about what’s around us. So many times, I’ve become so accustomed to my surroundings that I’ve become somewhat desensitized to them. This semester I’ve been humbled by how amazing God’s creation is. From the hospitable Spaniards who’ve befriended me and the kindness of my professors to the beautiful view along the river and the countless pigeons that are equivalent to NWC’s squirrels, I’ve seen God’s handiwork all around me. The message on the first Sunday at the church I attend here focused on Nehemiah 2:20 which says, “I answered them by saying, “The God of heaven will give us success. We his servants will start rebuilding, but as for you, you have no share in Jerusalem or any claim or historic right to it.” I also like to think of this as “The God of the universe.” The God of the universe loves me. I so easily forget that when I get caught up in my daily life, but that doesn’t make it any less true. As I finish this semester abroad and return home to start the next phase of life, I hope to continue to witness the wonder of God’s amazing creation.